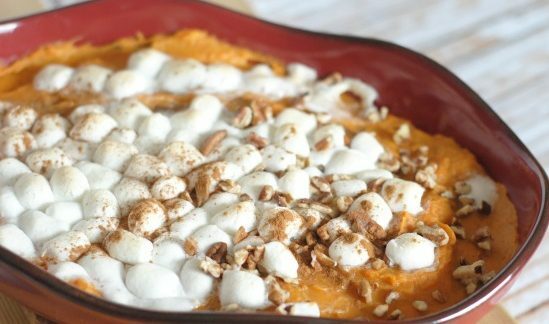 It’s time to enjoy this delicious Maple Sweet Potato Casserole! 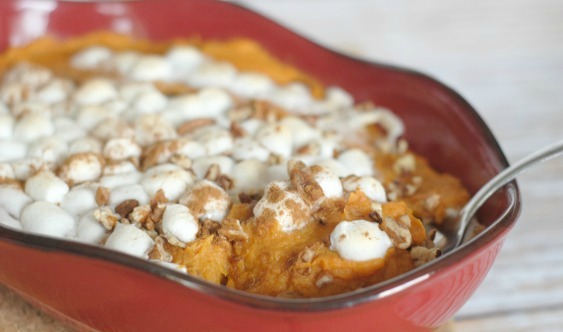 Get ready for a delicious Thanksgiving meal complete with Maple Sweet Potato Casserole. 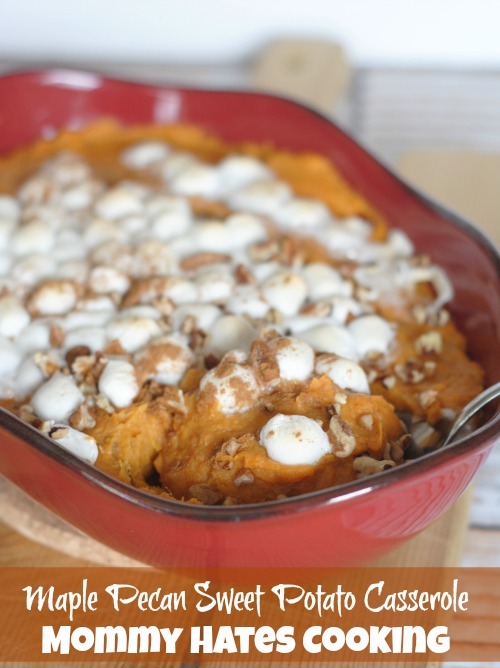 One of my all time favorite foods for Thanksgiving and really any holiday is Sweet Potato Casserole. My picky eater, who doesn’t eat veggies, he even ask for more! That’s a HUGE win in my book! My favorite aspect of this casserole was the maple syrup. I absolutely love real maple syrup. It is my ultimate picture of comfort food. This recipe was one that I actually stayed really close to the actual recipe. I tend to always adapt and change a few things, but I love that it uses foods that you would find in your pantry. 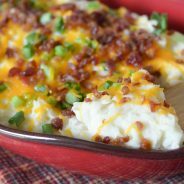 My husband request this on a regular basis now, but it’s one of his favorite sweet tasting side dishes. 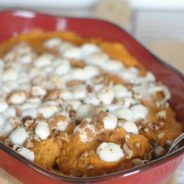 How do you make Maple Pecan Sweet Potato Casserole? 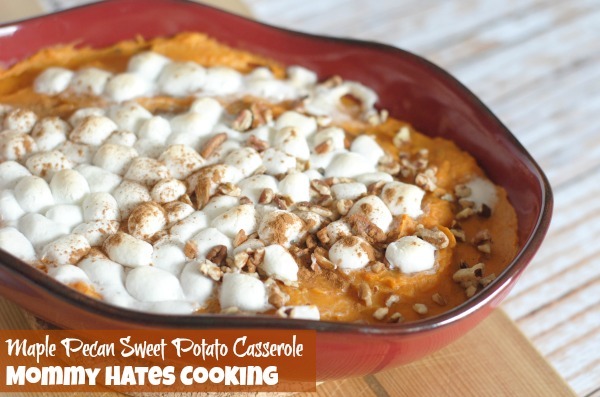 It also includes the signature part of sweet potato casserole, marshmallows. I always have to sneak a few too before they go on top of the casserole. What can I say, they speak to me. The one thing I did do was only put pecans on half of the casserole. I am allergic to pecans and thankfully am not deathly allergic so the cross contamination isn’t a huge concern for me, but I still wanted to be able to eat some of this casserole. I also topped it with cinnamon as well. As soon as it came out of the oven we were ready to dig in! 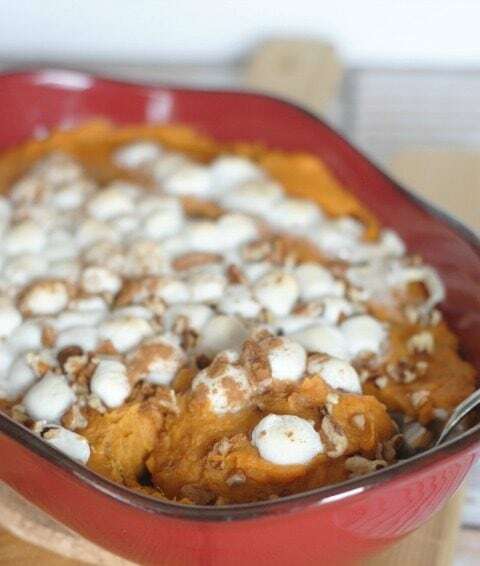 Will sweet potato casserole be on your table for Thanksgiving this year? 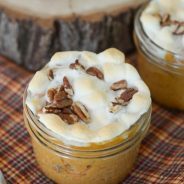 What do you need for Maple Pecan Sweet Potato Casserole? Now, that may seem like a long list, but most of it you will likely already have in your spice cabinet. Are you ready to get started? Let’s get this Maple Sweet Pecan Casserole on the table! Be sure the potatoes are cooked and peeled. 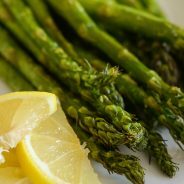 These can be peeled and boiled in a large stock pot until soft if you have not already cooked them. Place cooked potatoes in a large mixing bowl, then add in the cream, butter, syrup, salt, pepper, vanilla, cinnamon, and all spice. Mix this well. Spray a casserole dish with nonstick cooking spray, and spread the mashed sweet potato mixture in evenly. Bake for 15 minutes on 350*. Carefully remove, sprinkle with marshmallows, pecans, and a dash of cinnamon. Bake for an additional 10-12 minutes or until marshmallows are slightly browned. 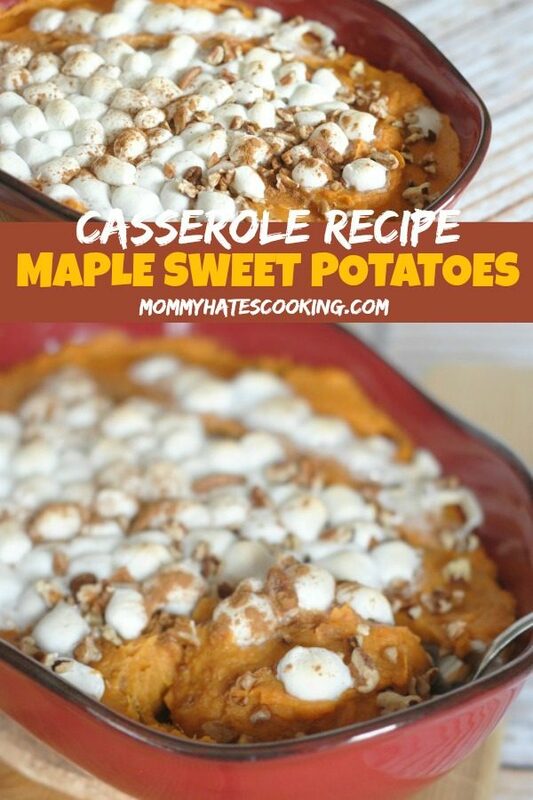 This looks like something my family would enjoy, but I need a more specific amount (like “cups” or “weight” ) of sweet potatoes, as the ones I see in our stores are often huge! Thanks! This looks yummy! I’m adding this to my Thanksgiving dinner. Thanks for sharing. Stopping by from Let’s be Friends. This looks so yummy! Makes me excited for the holidays. Thanks for sharing for the #homemattersparty. Delicious! The recipe pics are so tasty. You made it so beautifully. Love this. I will try this recipe.